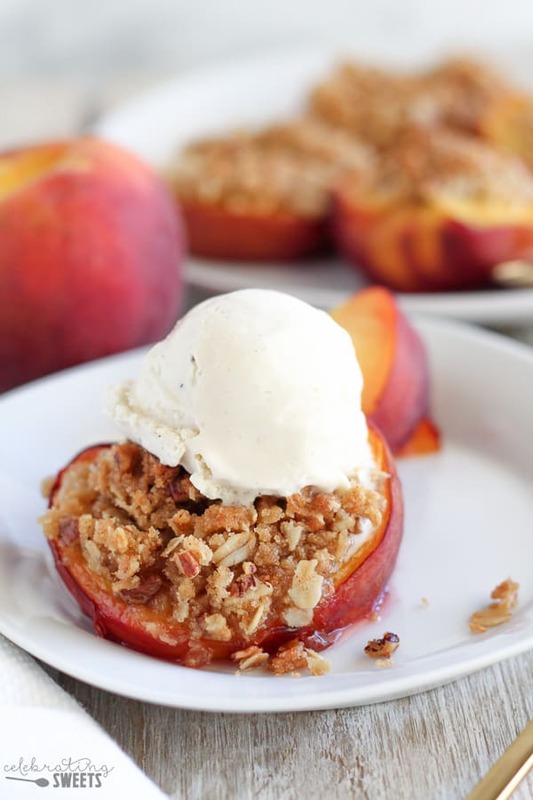 Baked Peaches – Fresh peaches filled with a brown sugar cinnamon pecan streusel and baked until juicy and bubbly. 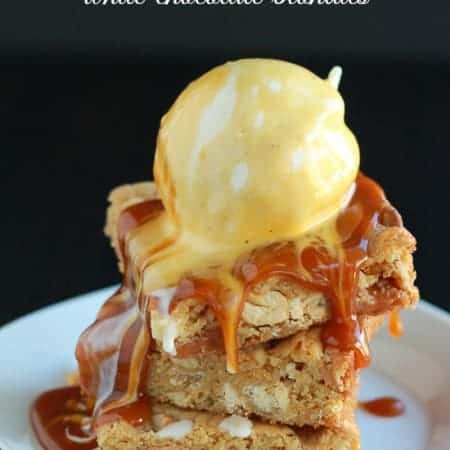 Serve warm topped with vanilla ice cream! Stop what you’re doing. You need to grab some peaches, stuff ’em with a brown sugar cinnamon pecan struesel, and bake them until they’re warm and juicy. Top them with a scoop of ice cream that will sloooowly melt down onto the peach like an ice cream river. Are you still reading or have you run off to your kitchen? Let me repeat that: Ice. Cream. River. I first shared this recipe almost three years ago and it is one of my favorite peach desserts. I thought it was time to give this recipe a few new photos, and to remind you how fantastic it is! 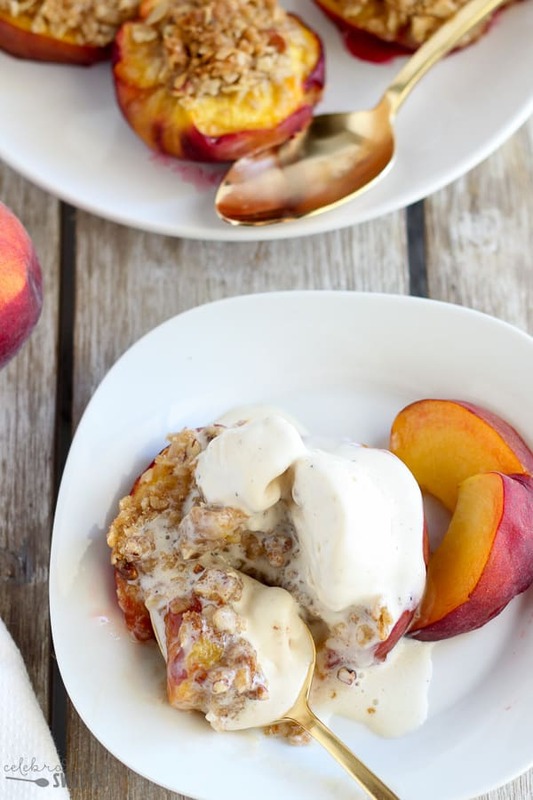 If you like peach crisps, you will love this dessert. It tastes really similar to a peach crisp, with a different presentation. This recipe can easily be scaled down to feed two people or doubled to feed a crowd. 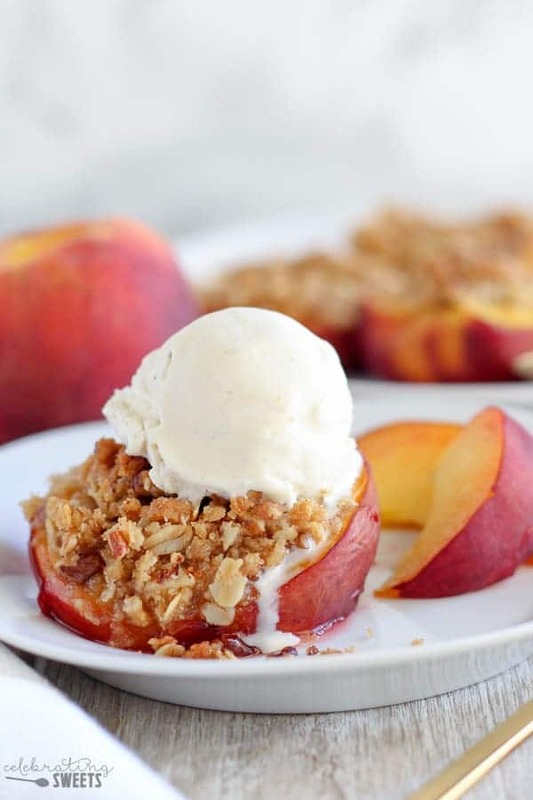 I absolutely love, love, love the combination of warm baked fruit, buttery crumble topping, and cold ice cream. Perfection. Although we are still in the midst of a long hot summer, I know that Fall is just around the corner. The apple and pumpkin recipes have begun popping up on Pinterest, and I see football, cider, scarves, and pumpkin lattes in the near future. But, before we move onto Fall I hope you get a chance to grab some beautiful fresh peaches and give this recipe a try. 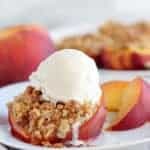 Fresh peaches filled with a brown sugar cinnamon pecan streusel and baked until juicy and bubbly. 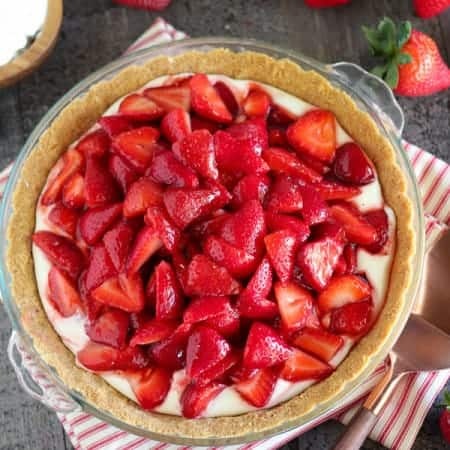 Serve warm topped with vanilla ice cream! Preheat oven to 350°F degrees. Butter a baking dish that is big enough to hold your peaches and set aside. Using a melon baller, scoop out and discard the red flesh from the center of each peach, create a cavity large enough to hold streusel but leave enough flesh to give the peach stability. Place peaches cut side up in your baking dish. In a mixer fitted with the paddle attachment, combine flour, sugars, cinnamon, salt, pecans, and oats. Add in diced butter and mix on low until the mixture is crumbly and the butter is pea sized or smaller. 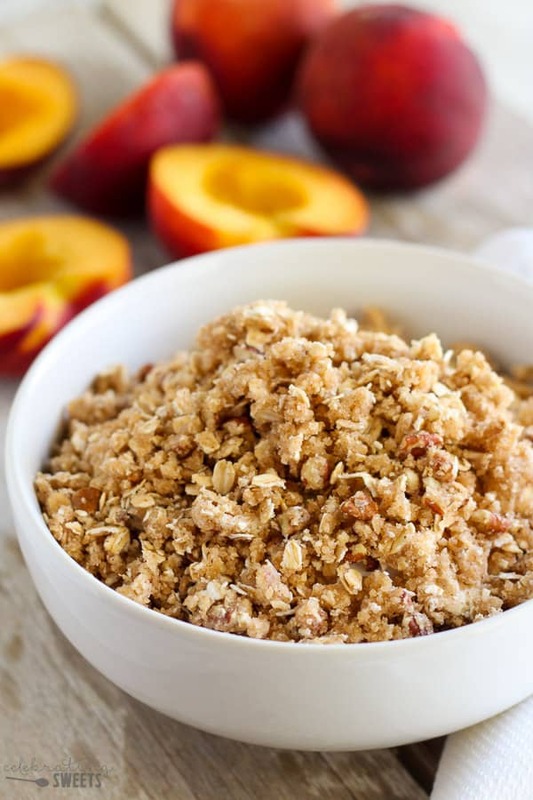 Fill the center of each peach with the streusel mixture. Bake peaches for 35-45 minutes, until the topping is lightly browned and the peaches have softened but are still holding their shape. Allow to cool slightly. Serve warm with vanilla ice cream. Has anyone ever tried this in the microwave? Hi, Pauline. I have not. It you try please let me know how it turns out. Enjoy! 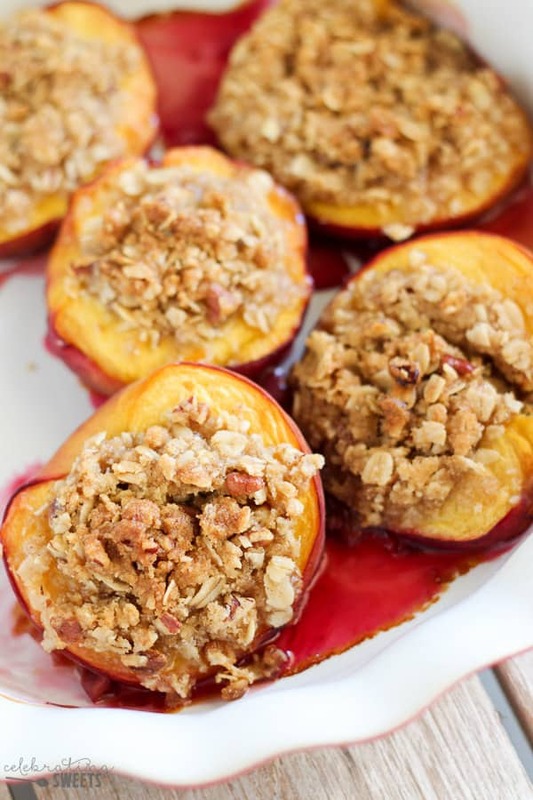 I came across stuffed peaches several years ago, and now they are an annual breakfast staple! I add coconut to ours and use coconut oil in lieu of the butter. Beings I serve them for breakfast, we top them with yogurt; oh so yummy! 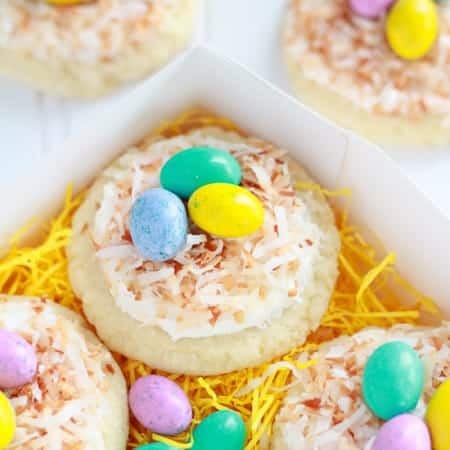 Thank you so much for sharing this scrumptious recipe!! You are very welcome. Glad that you enjoyed them. This turned out so amazing. It was super simple to make, but looked so fancy, and had so much flavor. Definitely a keeper.